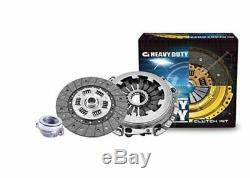 HEAVY DUTY CI Clutch Kit for Holden EH HD HR HK 6 Cyl Red Motor 08/1963-04/1969. Ci Heavy Duty Clutch Cover. Model - Holden EH HD HR HK. Engine Code - Red Motor. Engine Size - 6 Cyl. Year of Build - 08/1963 - 04/1969. Clutch Dimensions - 220mm clutch plate X 10Tooth X 22.5mm. New to Clutch Industries is the Heavy Duty (HD) clutch system; a tough, no-nonsense clutch upgrade. Engineered to handle loads of torque, it leaves the standard specification clutches behind. The HD clutch is built to endure the rugged demands of workhorse vehicles. A logical choice for those who demand relentless reliability. The HD clutch system is ideal for vehicles involved in activities that subject standard clutches to higher than usual loads. It is equally comfortable navigating congested city streets. They provide drivers with a powerful next level upgrade to standard kits. Cover Assembly Clutch Plate Thrust Bearing Also includes Spigot Bearing. We understand that your car may be off the road and requiring a clutch asap, therefore our warehouse team will be ensuring it leaves our warehouse without hesitation. If you accidentally order the wrong part, no worries. All questions must be done through eBays messaging system. Listing and template services provided by inkFrog. The item "HEAVY DUTY CI Clutch Kit for Holden EH HD HR HK 6 Cyl Red Motor 08/1963-04/1969" is in sale since Tuesday, March 6, 2018. This item is in the category "Vehicle Parts & Accessories\Car & Truck Parts\Transmission\Clutches". 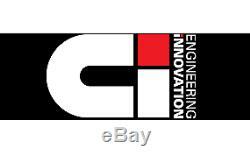 The seller is "captain_clutch_australia" and is located in Melbourne.